Shooting the freestyle swimming is a tricky activity. Depending on the swimmer's age, during a meet, you may or may not see them breathe during a 50 meter race. If they don't breathe, then there's no "photographic connection" - they're just a body gliding through the water - at the pace of the lead car in a Sprint Cup race. Underwater is a touch easier because you see their face all the time. The challenge underwater tough is timing out the arm placement, most notably, the pulling arm. You see, if the arm closest to you is pulling when you take the shoot, while it may be a good shot, it completely blocks the swimmer's head in a non-creative way. So, when shooting freestyle underwater, it's vitally important to ensure that the face can be clearly seen, as above. And the best way to do that is make sure you are lower than they are. The lower angle allows me to focus up in the water column. When you focus up, your swimmer's face will almost always be seen. Also important is to ensure that the angle of your flash is exact so that when you trip the shutter button, the flash lights the swimmer's face. Watching a swimmer swim freestyle is like watching an ice skater skate. The glide is perfect and fast, with a little side-to-side swivel. It is the graceful and elegant swim stroke we all learned growing up perfected. 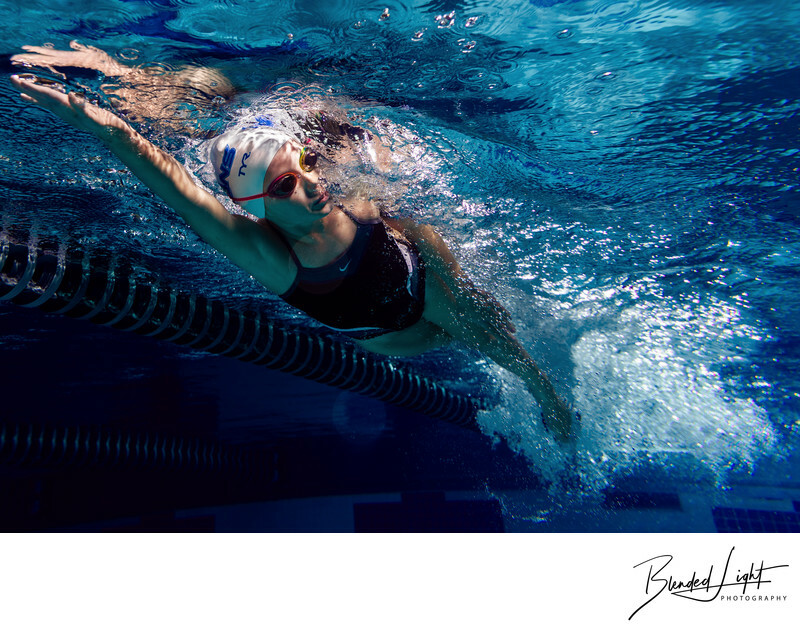 I love working with athletes who practice and train as hard as swimmers do. I would love to work with you, so if I can help in anyway, please feel free to reach out and connect. 1/250; f/3.5; ISO 100; 24.0 mm.